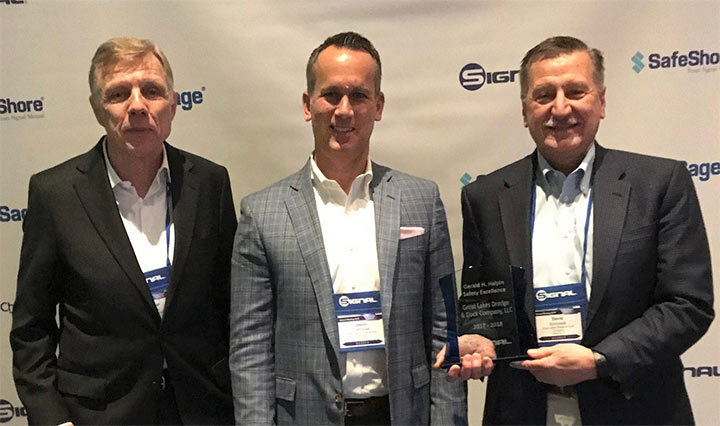 Great Lakes Dredge & Dock Corporation was the recipient of Signal Mutual Indemnity Association Ltd.’s Gerald H. Halpin Safety Excellence Award at the Association’s Annual Members Board Meeting in Orlando, Florida on January 25, 2019. Chosen from over 250 member companies, GLDD received the Association’s safety recognition based on continued advancement and demonstration of the importance of employee safety and health. The Gerald H. Halpin Safety Excellence Award is Signal’s highest award of honor designed to recognize the Signal Member who has exemplified the promotion of employee safety and health throughout their organization. GLDD was recognized for anchoring safety as a “core value” in their commitment to the prevention of workplace injuries and illnesses, and establishing safety initiatives that are integrated throughout the organizational structure through the implementation of a Safety Management System.